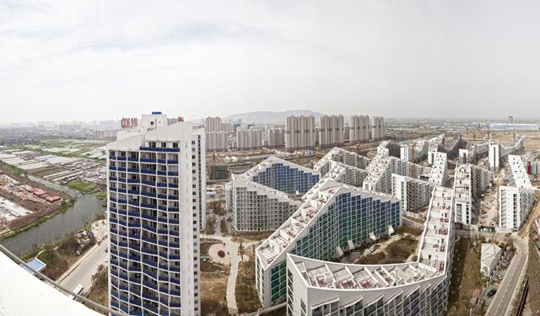 In wetlands on the outskirts of the city of Wuxi in eastern China, the new Tian Yi neighbourhood is seeing the light of day. The former industrial area will be integrated into Wuxi’s existing urban structure, and the area’s natural environment will once again have its original flora and fauna. With the focus on sustainability, Tian Yi will be an independent and compact mixed neighbourhood with homes and businesses, allowing residents to fulfil all their needs locally. The area is part of a larger master plan for the 2 km² big area. Tian Yi is situated in low-lying wetland surrounded by canals and natural watercourses. The master plan for the new neighbourhood is based on three landscape elements: an outer ring, consisting of wetland with dense vegetation, a green inner ring that will function as a play and leisure area and a central sector with gardens and green oases. The neighbourhood will have homes and businesses, offices, hotels and shops. It will have public functions such as the library, schools, day care institutions, a health centre and municipal sport and leisure facilities. All the neighbourhood’s public institutions are located within walking distance from the residential area in the innermost green sector, allowing residents to live and work in the same local area. It is hoped that the proximity principle of the master plan will result in a cheerful, harmonious neighbourhood with a reduced need for private cars and other polluting forms of transport. Cars will be parked in underground car parks beneath the homes and will therefore not enter the centre of the town. It will not take more than five minutes to walk from any of the homes to shopping facilities and public transport, which will ensure good connections with Wuxi. This will make the town centre more pedestrian- and bicycle-friendly. The homes will be positioned in a zigzag shape so that they are all north-south facing. All rooms to use during the day will face the South so as best to exploit the sun’s passive heat. The zigzag positioning and sloping roofs will also allow in the most daylight, make for better at circulation in the summer and optimise the view from each individual home. The homes are positioned with their back to the wind in the winter and are open to the breeze during the summer. The roofs will have both solar heating panels for heating and hot water and solar cells to generate electricity. The town will be supplied with water by the surrounding rivers. Water will be channelled from one river to the other, flowing through a system of canals, reeds and meadows, where it will be purified naturally, making it suitable for irrigating the surrounding farmland. Water will also flow through network of channels and pools in between the houses, helping to cool the microclimate during the summer. Purifying the water will also make for cleaner groundwater. Dense vegetation will provide shade between the houses and protect them against the wind during the winter. Water-saving systems in the houses will e.g. use grey water to flush toilets and collect water from the roofs. The homes will have integrated waste sorting systems, the waste being collected and taken to a waste processing plant where it will be recycled to as high a degree as possible.